'Rescuers Without Borders' inaugurates community center in Adora in South Hevron Hills. 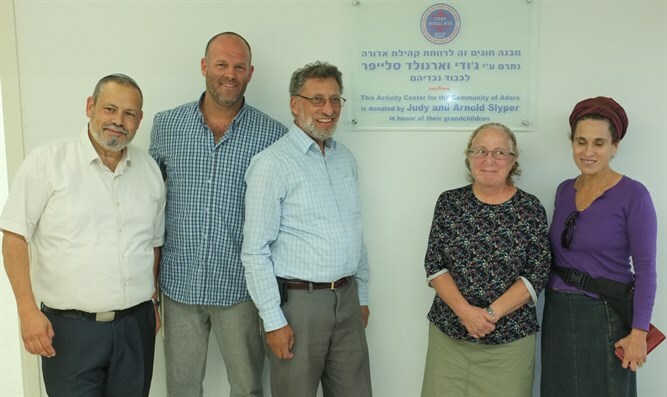 The 'Rescuers Without Borders' organization marked the establishment of a new community center for the benefit of the residents of Adora in the South Hevron Hills. The station was built with funds provided by donors Judy and Arnold Slyper. The inauguration ceremony for the center was attended by the head of the South Hevron Hills Regional Council Yochai Dimari, representatives of the organization Natalie Sofninsky and Yehudit Tayar, and residents of Adora and the surrounding area. Mrs. Natalie Sufinski stated that the construction of the building is part of the organization's plan to improve the lives of the residents of the area and wished to thank all the partners of the Slyper family in bringing the new community center to fruition. The 'Rescuers Without Borders' organization is a volunteer group which provides emergency medical care regardless of nationality or location, including in Judea and Samaria.